Cherries are prized because of their sweet fruits and luxurious timber. They are full of antioxidants and other micronutrients, giving them great health benefits. Cherry fruits are widely considered tasty snacks with good nutritious value. Their origins can be traced to the Black and Caspian Sea region where Asia and Europe converge. It is thought that from there, they spread to Europe and later to the United States with the help of early colonists. Cherry trees, also valued for their high-quality timber, are now cultivated and naturalized all over the world. Relieving pain and inflammation. Cherries have proven to be useful for treating painful health conditions, such as arthritis, lumbago, and gout. 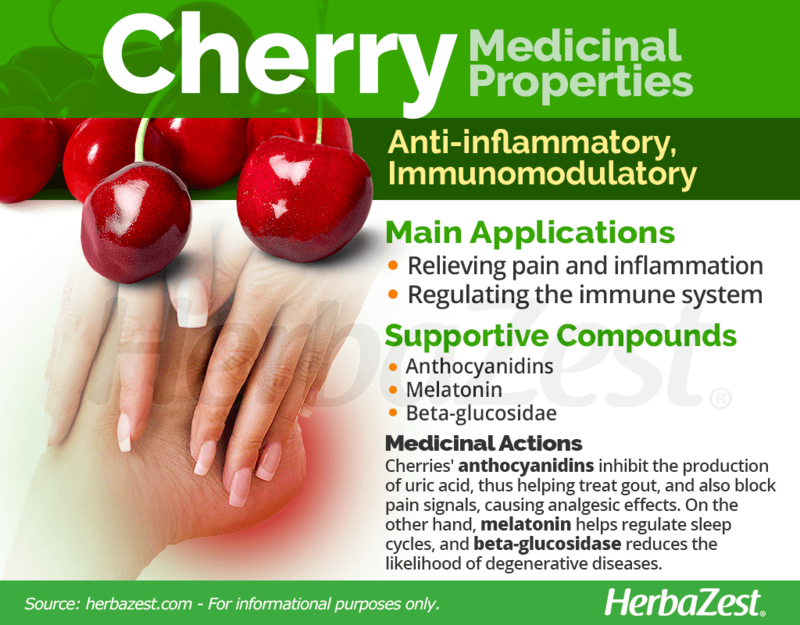 The daily consumption of half a pound (228 g) of cherries has shown to be very effective at preventing gout attacks. Regulating the immune system. The consumption of cherries has been linked with improvement in endocrine balance, as well as the natural regulation of sleep-wake cycles. Detoxing the body. Cherries help the body to get rid of toxic substances that tend to accumulate in major organs, such as the gallbladder and the liver, hence improving their function. Improving dental health. Drinking cherry juice can prevent tooth decay by reducing the accumulation of plaque. Additionally, both tart and sweet cherries are consumed for their nutritional value. They are rich in calcium, phosphorus, magnesium, and potassium, as well as vitamins A and C, among other phytonutrients with a strong antioxidant activity. These antioxidants play an important role in protecting the cells from oxidative stress and reducing the risk of heart diseases, thus preventing the development of serious illnesses. Cherries are rich in anthocyanidins, powerful flavonoids capable of blocking the enzymes responsible for sending “pain messages” to the cells, with analgesic effects comparable to those of ibuprofen and naproxen. While all cherries carry great amounts of antioxidants, tart cherries also offer a specific one called melatonin, which is also a hormone produced by the pineal gland and responsible for regulating sleep cycles. On the other hand, ripe sweet cherries contain high levels of a compound called beta-glucosidase, which is thought to reduce the likelihood of degenerative diseases. Cherries' anthocyanidins have also been shown to inhibit the activity of xanthine oxidase, an enzyme that plays an important role in the production of uric acid, thus helping treat gout. Furthermore, the antioxidant activity of anthocyanidins in cherries has proven to be stronger than that of vitamin E in the same amounts, and it is very useful for alleviating muscular pain after strenuous exercise routines. It has been suggested that daily consumption of anthocyanins may also play a role in preventing arterial stiffness and hypercholesterolemia, most likely due to their anti-inflammatory properties. However, further research in needed. WHETHER THEY ARE SWEET OR TART, DARK CHERRIES ARE RICHER IN FLAVONOIDS THAN THEIR LIGHTER COUNTERPARTS. Cat's claw and carambola also possess anti-inflammatory properties, whereas kiwi and ginkgo can help regulate the immune system. Cherries are generally regarded as safe, well-known for not having any negative effects or contraindications. However, caution is recommended when eating them raw, since their pits could present a choking hazard. 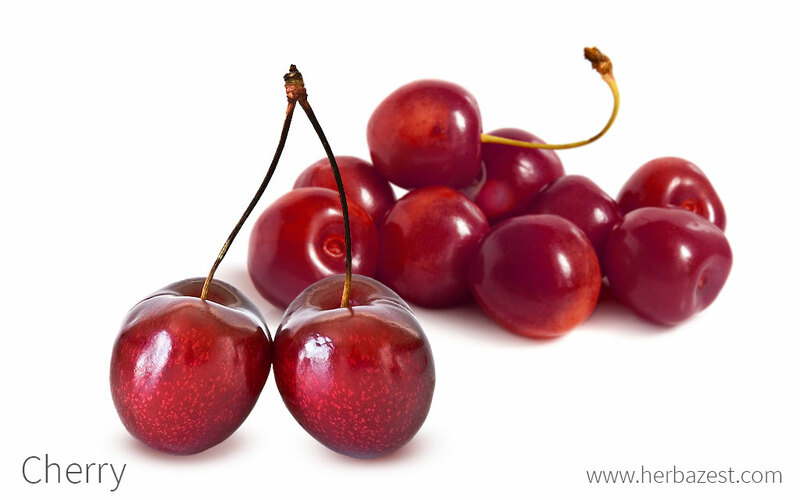 Sweet cherries are not only low in calories, but also a good source of fiber, which contributes with blood sugar metabolism and digestion; as well as vitamin C (ascorbic acid), necessary for immunity, iron absorption, and skin health; and potassium, which plays a key role in regulating blood pressure. Additionally, small amounts of B-complex vitamins, important for bodily functions, are also present in cherries, as well as vitamins E (alpha-tocopherol) and K (phylloquinone), along with minerals such as magnesium, iron, phosphorus, calcium, and zinc. One cup of sweet cherries with pits (138 g/4.9 oz.) provides 87 calories and 12% of the daily value for dietary fiber. The best way to reap the health benefits of cherries is consuming them as food on a daily basis. However, for medicinal purposes, cherry can be taken as a supplement in different forms. Both tart and sweet cherries are consumed chiefly raw or juiced in order to take advantage of their nutritional value. Raw. Consuming fresh cherries is the easiest of reaping their nutritional content. Juiced. 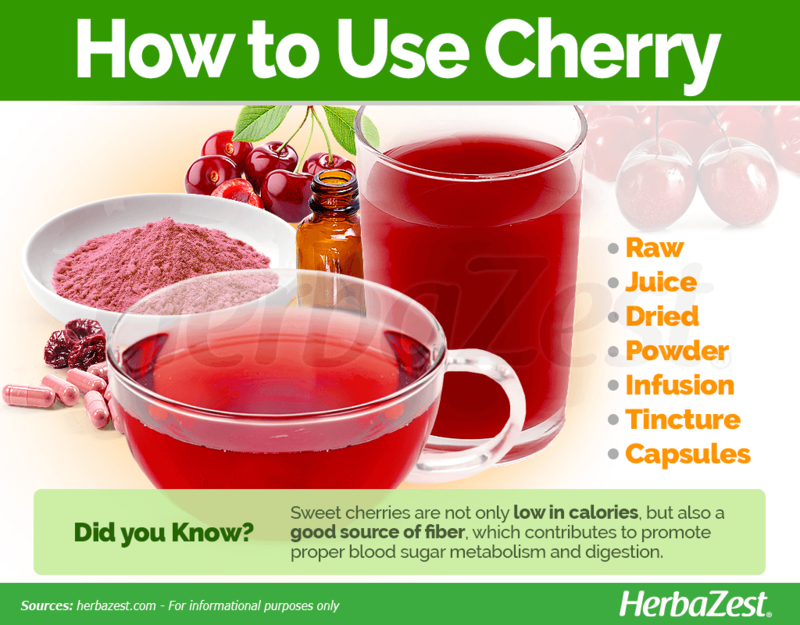 Home-juiced cherries retain most of their nutritional and medicinal benefits. A daily glass of tart cherry juice each day can help to lower uric acid levels in people with gout, as well as increase levels of melatonin, which can improve insomnia and lead to better sleep quality. Dried. are also very popular as a healthy snack, and can also be added to morning cereal for an antioxidant punch. Cherries are commonly used to make desserts, pastries, and other confectionery like syrups, candies, and jellies. Powder. The dried and powdered cherry bark, usually from the black or wild cherry tree (Prunus serotina), is also used to treat ailments like coughs, bronchitis, gout, diarrhea, and arthritis. Infusion. Brewing and drinking cherry tea is a very popular way to reap some of the antioxidant benefits of these fruit. 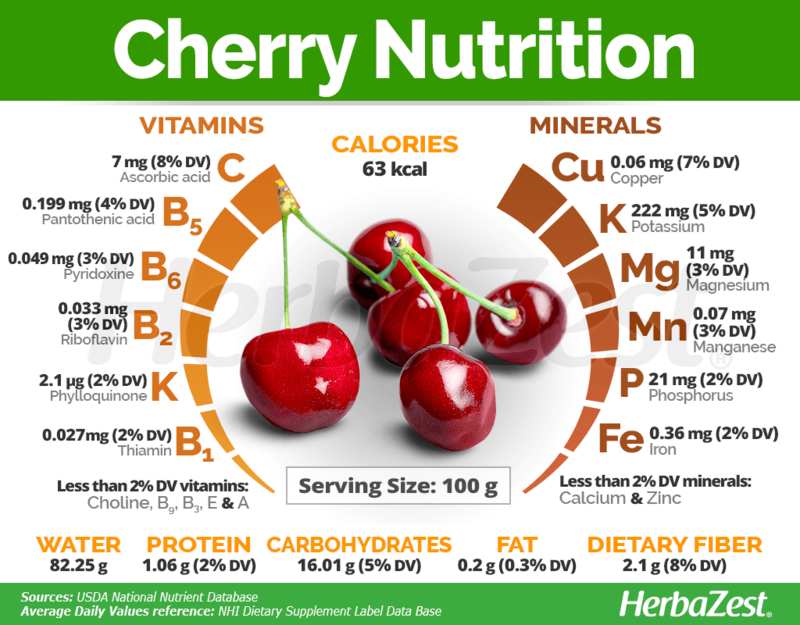 Cherry supplements on the market are typically not made from sweet cherry (Prunus avium), but rather from black cherry (Prunus serotina) or tart cherry (Prunus cerasus). Capsules. These preparations come in standardized doses and are often taken to treat chronic inflammation diseases, such as arthritis and rheumatism. Tincture. This remedy can be obtained by infusing the fresh or dried cherry fruits or bark with vodka, and it is typically taken in medicinal doses in order to relieve headaches, as well as achy muscles and joints. Raw, dried, and juiced cherries are widely available at most grocery stores and farmers' markets. They are in season during the summer, so that is when they are the most ripe and flavorful. Both cherry bark powder and cherry teabags are readily available through online retailers. 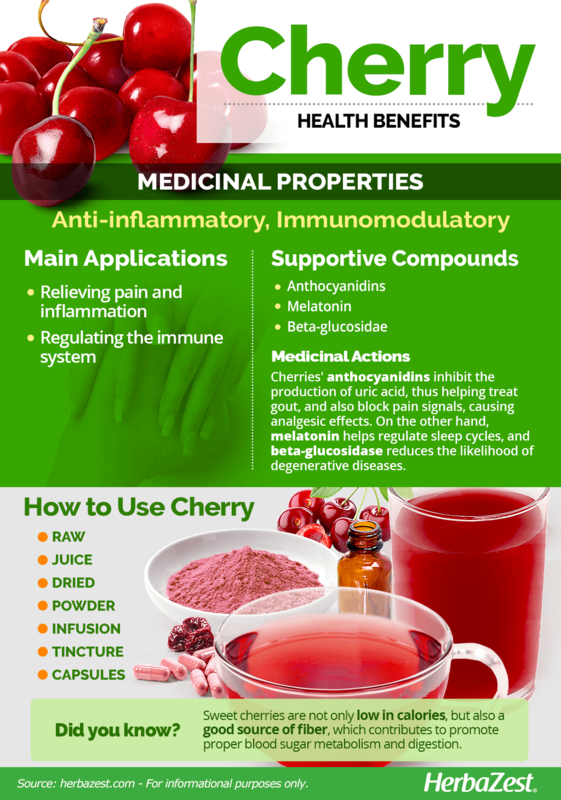 Cherry supplements, such as capsules and tinctures, can be found at most specialized herbal stores and pharmacies, as well as through online retailers. Cherry trees are beautiful to have as woody ornamentals in a backyard because of their stunning flowers in the spring and their red leaves in autumn. However, the advantage of cultivating a cherry tree is being able to enjoy its delicious fruits, as well as its many health benefits. They are usually propagated from grafting, since this allows to pick the variety that is best suited to local climate conditions. Cherry trees grow best in a loose, well-drained soil with a neutral to acidic pH. They require full sun, moist conditions, and cold exposure in order to break dormancy, but once flowered, they will not resist temperatures as low as 30°F (-2°C). Cherry trees typically grow on the edge of woodland areas, with plenty of room. The trees can grow up to 80 feet (25 m) in height and spread to the sides, so at least 22 feet (7 m) of space is needed between each plant. Cherry trees should be pruned thoroughly during the first year only, as soon as the trees lose all of their leaves. During following years, is best to only prune them lightly. They need to be protected from several plagues and infestations, including mites, flies, beetles, and the cherry mottle leaf virus. For those looking to harvest the fruit, it is important to keep nesting birds away, since they eat the cherry fruits. While not all cherry species produce edible fruit - and some wild cherries are even toxic - their elegant shape, bright white to light pink flowers, and range of sizes make them desirable for landscaping, with both ornamental and functional purposes. Depending on the variety, cherry trees can grow up to 80 feet (25 m) in height and have smooth, shiny, reddish-brown bark. All cherry trees (Prunus spp.) are members of the Rosaceae family, among many other herbs of economical importance such as almond (Prunus dulcis), apple (Malus domestica), pear (Pyrus communis), peach (Prunus persica), and strawberry (Fragaria ananassa). The Prunus genus contains around 430 flowering species. As a food crop, cherries can be divided between sour or tart and sweet. While sweet cherry (Prunus avium), black cherry (Prunus serotina), and tart cherry (Prunus cerasus) varieties occur naturally in the wild, when it comes to commercial cherries, centuries of man-made hybridization have brought many cherry cultivars, each one with unique characteristics, from size and shape of the trees to flavor and sugar content. Sweet cherry cultivars are the most popular for direct consumption, and are distinctively separated in three groups: dark, red, and yellow. 'Bing'. This is probably the most popular sweet cherry cultivar. Dark and glossy red, it is sweet and acidic but with excellent flavor: juicy, firm, and crunchy. 'Attika'. This cherry cultivar grows fruit with a long heart shape, large size, dark red to black color, and red flesh. It has a strong, pleasant, sweet flavor, consisting of 18 - 21% sugar, and it is firm and crunchy. 'Chelan'. With a mild flavor and moderate sweetness (17 - 19% sugar), this variety is firm, round, and heart-shaped, with a rich color that goes from light mahogany to mahogany red. Other significant dark cherry cultivars are 'Cowiche', 'Kiona', 'Lapins', 'Regina', 'Santina', 'Selah', and 'Tieton'. 'Early Robin'. Medium-large in size and yellow-red blush colored, these cherries are heart-shaped, with a strong, sweet flavor, containing 17 - 19% sugar. 'Rainier'. With a large to very large size, these cherries have a round heart shape, pink-red blush over a yellow background, and clear-colored flesh. They are very firm with fine texture and a delicate, sweet flavor, consisting of 17 - 23% sugar. 'Stardust'. With a mild, sweet flavor derived from 16 - 19% sugar, this cultivar bears very firm cherries, large in size, with a flat heart shape, light red blush over a yellow background, and near-clear flesh. 'Benton'. With a bright, mahogany red color and medium to large size, these cherries are firm and have a great sweet flavor. 'Index'. Deliciously sweet and firm, these cherries have a medium-large size and are heart-shaped with a dark red color and medium-red flesh. 'Lambert'. Round to long heart-shaped, medium-sized, dark red in color, and with dark red flesh, these cherries are mildly sweet, with a rich flavor and moderately firm texture. Other significant red cherry cultivars are 'Skeena', 'Sweetheart', and 'Van'. 'Montmorency'. Created in France, this cultivar is the gold standard for the tart cherry processing industry. With a dark red color outside and inside, its intense pigmentation indicates high anthocyanin levels associated with enhanced nutritional benefits. 'Jubileum'. Developed and grown in Hungary, this cherry is very large with dark red flesh. Not as tart as Montmorency, it has very high sugar levels. 'Dantube'. A popular European cultivar, it grows medium to large dark red cherries that are slightly sweeter than Montmorency. Other commercially-significant tart cherry cultivars are 'Surefire', 'Balaton', 'Northstar', and 'Meteor'. Cherry trees are highly valued in the timber and fruit industries. Turkey leads the annual global production of cherries at around 445,000 tons, with the United States following with around 419,000 tons, Michigan being the largest producing state. Other cherry producers are Iran, Italy, and Spain. Cherry wood is highly valued in the timber industry for making fine furniture, hardwood floors, musical instruments, and wine casks. The wood is strong with a beautiful reddish tint that makes it desirable. Cherry wood is also sometimes used to barbecue because it adds a nice flavor to smoked meats. The Bellamy Herbal, Cherry, Prunus avium and other spp.